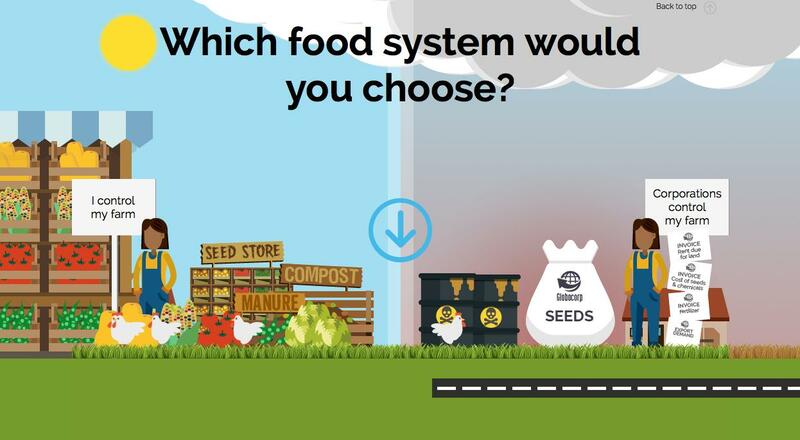 When publishing this infographic, GJN referenced a report produced by the International Panel of Experts on Sustainable Food Systems released this June. The report titled From Uniformity to Diversity, details the systemic problems within our current food system, which overly relies on monocultures, chemical fertilizers, pesticides, and antibiotics. In fact, the panel concludes that, “Modern agriculture is failing to sustain the people and resources on which it relies, and has come to represent an existential threat to itself.” The GJN infographic is an excellent visual demonstration of this danger. GJN notes that as corporate agriculture replaces independent farmers, farmer control over crops, markets, and resources is diminished. AGRA Watch agrees that the healthiest alternative is also the oldest. People have been growing food without monocultures, and chemicals for centuries. Traditional farming methods are more self-reliant and diverse, and make up a more sustainable, adaptable, and secure food system. Posted in agroecology, biodiversity, chemical pesticides, food security, News.